On Keti Koti, meaning ‘broken chains,’ we commemorate those who lived in slavery and celebrate the abolition of slavery on July 1st, 1863. All throughout the Netherlands people come together to remember those who were enslaved and contemplate what living in freedom means to them. Below you find an overview of events and activities organized in different cities in the Netherlands, taking place at the end of June or on the first of July. Did we miss your event? Let us know! As each year, the national commemoration in 2018 takes place in Amsterdam at the National Slavery Monument. On July 1st, the Bibi Spikri leaves Waterlooplein for the Oosterpark at 11 o’clock. When it arrives, the commemorative service starts at 13:00. After this contemplative element, we celebrate! The Keti Koti Festival in the Oosterpark features performances on several stages, a food market and lots more. You can find the full program, in Dutch, here. 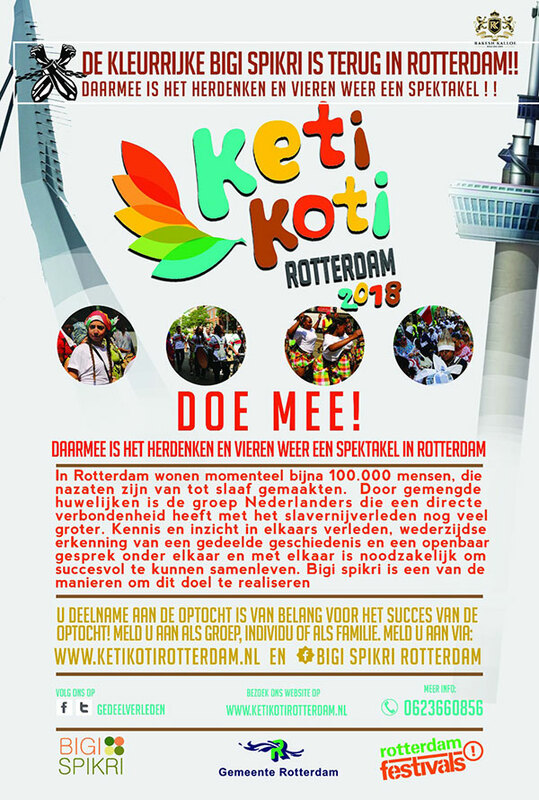 Rotte rdam celebrates Keti Koti on the first of July with a Bigi Spikri, starting at 11. You can sign up here to join. This year, the route will be Vierambachtstraat-Middelandstraat-Westkruiskade, to end at Wijkpark Oude Westen. Once the Bibi Spikri arrives at the park, the Keti Koti festival will start, at around noon. At the festival, expect performances by Sima Nosé So Nos, Dutch Caribbean Groove Orchestra and Stimofo. Find the full program, including several activities leading up to 1 July, here. In Zeeland, Middelburg is the location for the annual commeoration and celebration. On the 28th of June, a wake is held at the slavery memorial on the Balans square. For the first time this year, the celebratory activities take place on Plein 1940, in collaboration with Jun! Festivalmaand, on the 30th of June and the 1st of July. It features a market, several performances and good food. Keep an eye on their Facebook page to stay up to date about the full program. Groningen celebrates Keti Koti in and around the Nieuwe Kerk, on the first of July. Starting at 9:30 with a church service, the program runs till three. 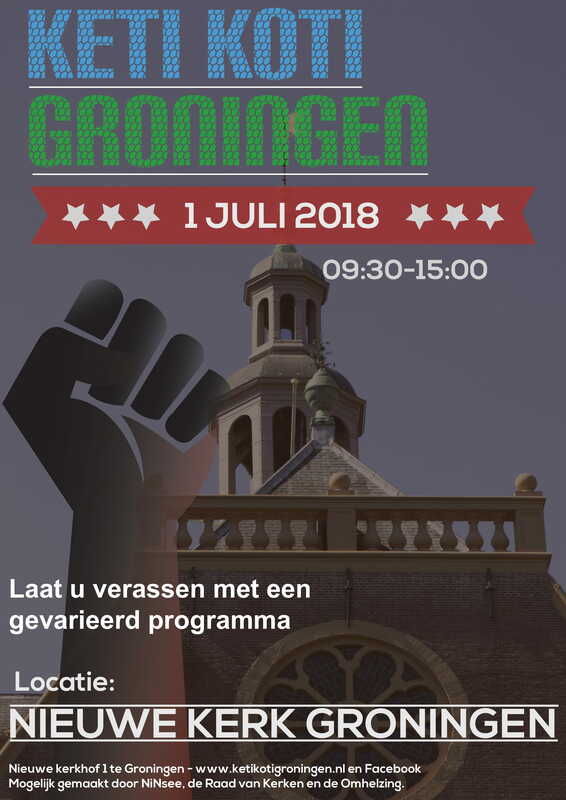 Amongst others, our colleague Barbara Henkes will talk about the book ‘Sporen van Slavernijverleden in Groningen’ and give a walking tour passing slavery heritage in the city. The program will have several workshops and activities, open to everyone. Take a look at the full program here, and let the organizers know you plan to join. For the first time this year, Utrecht has its own Keti Koti festival, taking place on June 30th. Two activities require a reservation. Nancy Jouwe will give a guided tour passing slavery heritage in the city centre, starting at noon. In the evening, the public library screens Ida Does’ documentary ‘3 Vrouwen’. The screening starts with a cup of soup and ends with a discussion with Nancy and Ida. Sign up here. The Afrika Museum in Berg en Dal hosts a festival on the 23rd of June, to celebrate living in freedom. From half past eleven to half past seven, you can enjoy music performances, food and lectures. A ticket costs five euros. Buy your tickets through their website.